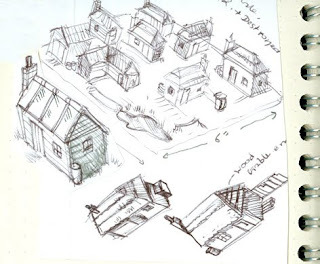 Some sketches I've made of Russian style buildings for my Blitz Freeze board, the idea will be that the will be doubles of most buildings so they can be replaced once hit by artillery fire or bombing. 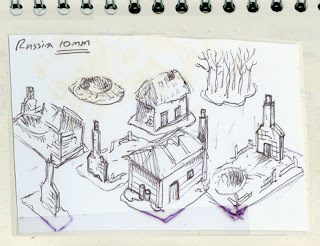 the top picture shows one of the terrain tiles which would in this case be 6" square. The trick with this terrain will be to get the snow effect to look believable on the buildings and surrounding terrain. I'm digging the damaged buildings idea.